A little over 2 years ago, one of our patients, Chris Laxamana, had LASIK surgery and decided to record his surgery day experience with his friend and colleague Matt Owen. 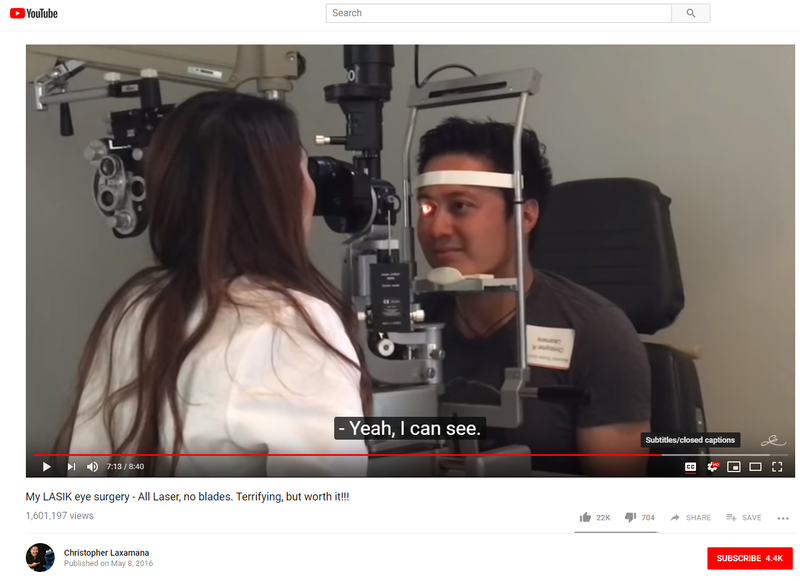 Both professional videographers and photographers, they are well skilled at editing together a great video but little did they know that his video would become one of the most viewed LASIK videos on YouTube – just over 1.9 MILLION views as of today, not to mention over 2,500 comments, with multiple messages being posted on a daily basis. Chris reached out to us a little while ago to do a follow-up video because since the original video became such a huge hit and he was getting inundated with questions from curious commenters about LASIK, his experience, how his vision is now and more. So he dropped back in for a visit to check his vision and sit down with LASIK surgeon, Dr. Neda Shamie, to ask the top 7 questions about LASIK he keeps getting on YouTube. Thanks for not only sharing your experience Chris, but helping educate more people about LASIK.